A Thought Shared ....: Three Lakes.. This is Lake Windemere, Cumbria, United Kingdom. 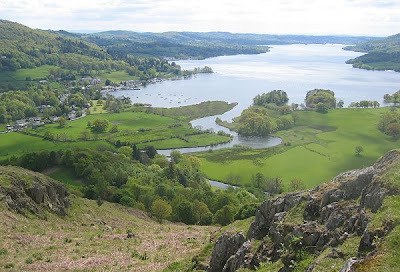 It is the largest of the lakes that make up the most beautiful and enchanting 'Lake District'. The opening words to this piece were written by William Wordsworth, and this was 'his' country. You can tell that he loved the area, you can see the flowers and you can hear the breeze. This is an area where love can flourish. Not too far away from here there is another lake. No romantic name this time, I am afraid. It is known as B30, and it contains 1.3 million tonnes of Plutonium. Nobody is quite sure w hat happens at the bottom of B30, but there are no fish, and birds landing on its surface have to be shot for fear of spreading radiation. Apparently, B30 has leaks and the authorities say that this is to be expected with a tank 50 years old. Did I forget to tell you that it is a tank? B30 is not like Lake Windemere in any way at all. This is as good a picture of B30 as you will ever want to see. This lake is part of the Sellafield Nuclear complex. Across the world, is another lake up in the mountains of the Ukraine. This lake is no B30 in appearance. It is more akin to Lake Windemere, except that it, like B30 is one of the most radioactive sites in the world. It is Lake Karachai, and is in close proximity to the old USSR Mayak weapons plant. I could find no picture of this lake, but I do remember seeing a picture years ago. It was not a pretty picture like the one of Lake Windemere. You will not find love in or around either of these lakes. The contents are what is left of fear, mistrust, and hatred. Nothing good ever comes out of those feelings. Nothing good ever can. Here are two links relating to B30 and Lake Karachai..
Those bastards, they will destroy this beautiful planet yet, what can we do other than sit by and wait? Destruction is well on the way. All nuclear installations have to be dismantled eventually, and where do they put the pieces? In the oceans, in deep mines, in lakes. For every installation decommissioned, two new ones come into service. The alternatives are no more acceptable as nobody wants wind generators or large solar panels in their back yards. Also, it is impossible to threaten other nations with a wind generator, but wave a piece of Plutonium around, and people run and hide.